Thomas Archibald Brown (1889–1959), known as "Big Tom", was police chief of St. Paul, Minnesota in the 1930s. He presided over a period of unprecedented corruption in which he assisted several major criminals, notably the Barker-Karpis gang and John Dillinger. He was eventually dismissed as chief, but retained a senior role in the Kidnap Squad, during which he continued to assist criminals. Later, he was demoted to detective, in which role he was involved in the killing of Homer Van Meter. He was finally dismissed from the force, but he was never successfully prosecuted for his crimes. Brown was born in West Virginia into a family of coal miners. He stood 6 foot 5 inches and was too tall to work in the mines, so he went to St. Paul and worked at various jobs before joining the police in 1914. He married Mary Raffety, and the couple had four daughters and one son. St. Paul's police already had a reputation for tolerating the presence of criminals in the city. John O'Connor developed the so-called "O'Connor system" in which criminals were protected from extradition so long as they committed no crimes while they were in the city. The system attracted big-spending gangsters who supported other lucrative businesses, particularly illegal speak-easies. Brown achieved local fame after killing escaped murderer Edwin Rust in a gunfight. He was appointed to the "Purity Squad", which was supposed to identify and close down gambling dens, speak-easies, and brothels. He quickly learned to build contacts with the gangs who ran them and to take bribes. In 1926, he was arrested for stealing a large quantity of alcohol that had been confiscated in a raid. He was later released through lack of evidence and reinstated. The Purity Squad became notorious for its repeated failure to find any illegal activity, and a board of inquiry was moving toward dismissing Brown. The dismissal was suddenly withdrawn, however, probably due to pressure from corrupt politicians with links to local crime bosses, particularly Leon Gleckman, "the Al Capone of St. Paul". In 1930, Gleckman engineered Brown's appointment to chief of police. In return, Brown protected Gleckman's business interests. Gleckman was kidnapped by rival racketeer Jack Peifer, and Brown worked hard for his release. The ransom was paid, but one of the kidnappers was later found shot dead by an unknown assailant. Brown took the ransom from the man's safe; he later claimed that he stored it at police headquarters, but it was never located. Brown's tenure as chief came to an end when he became involved with the Barker-Karpis gang, who had come to St. Paul at the invitation of Gleckman's rival Jack Peifer. The gang committed a series of robberies until a neighbor recognized them from pictures in True Detective magazine. Brown delayed responding to the information, and he or one of his associates tipped them off. They cleared out believing that Ma Barker's lover Arthur Dunlop had informed on them, and they shot him and dumped his naked body. The Dunlop murder sealed Brown's fate as chief, as the publicity led to questions about how the gang had gotten away. He was dismissed as chief by the new mayor, who was elected on an anti-corruption ticket. However, he remained a member of the force. After his dismissal, Brown attempted to get elected as sheriff of Ramsey County, Minnesota. According to FBI informants, members of Dillinger's gang, particularly Homer Van Meter, paid $1500 into Brown's election campaign, but he was unsuccessful. Despite suspicions against him Brown was appointed to the newly formed Kidnap Squad. With prohibition over, local criminals turned to new sources of income. Racketeers Jack Piefer and Harry Sawyer suggested that the Barker-Karpis gang should move into kidnapping. They kidnapped wealthy businessman William Hamm. Brown informed them of plans by police to trap them. The ransom money was successfully collected, and a cut given to Brown. Another kidnapping followed. 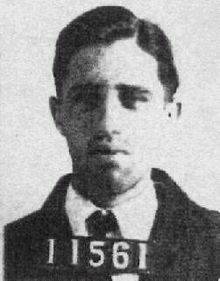 Edward Bremer, a local businessman, was snatched on his way to work after dropping his daughter at school on January 15, 1934. The FBI became actively involved. When it became evident that leaks were coming from the local Kidnap Squad, Brown was isolated from the investigation. On August 23, 1934 Brown was involved in the killing of former ally Homer Van Meter at the corner of Marion Street and University Avenue in St. Paul. Van Meter was lured to a supposed meeting, but was confronted by four police officers who were waiting for him, led by Chief of Police Frank Cullen. All, were heavily armed with rifles and Brown carried a Thompson submachine gun. The officers later claimed Van Meter ignored their command to stop and fled into a nearby alley, where he fired twice on the officers with a .45 caliber pistol. Chief Cullen, armed with a rifle, held his fire as a bystander walked past, but the remaining officers opened fire on Van Meter, who fell dead. He was 27 years old. Brown continued to fire at Van Meter as he lay prone; the impact of the bullets ripped off one finger and nearly severed a thumb and finger of the right hand. The body was found to be armed with a .45-caliber Colt automatic pistol. The number and severity of Van Meter's wounds were attributed to the use of the Thompson submachine gun. Van Meter's family later said that their kin had been used for "target practice". By this time Brown was under investigation by the FBI. Many of the kidnappers had been arrested and detained by the beginning of 1935. A great deal of information about Brown's involvement given by minor gang members Edna Murray and Byron Bolton. As a result Brown was dismissed from the force. However, as most of the evidence was hearsay, Brown was not arrested or charged. He challenged his dismissal, but the evidence of his corruption was considered sufficient to justify it. Brown moved away to open a liquor store. He continued in the profession for some years, but was later arrested for non-payment of tax and for operating without a license. He was sentenced to a year in jail, but the sentence was suspended. He died of a heart attack in 1959. ^ Folsom, Robert, The Money Trail: How Elmer Irey and His T-men Brought Down America's Criminal Elite, Potomac, 2010, pp. 247–8. This page was last edited on 22 February 2019, at 17:52 (UTC).